Nigerian anti-graft investigators have seized money raised by the head of the Nigerian Stock Exchange to support US presidential candidate Barack Obama. The Economic and Financial Crimes Commission said it would give the money back to those who attended a gala dinner in Lagos last month. The EFCC said it had seized 74m naira ($630,000, £314,000), but said no Nigerian laws had been broken. US political parties are not allowed to receive contributions from abroad. Stock exchange chairwoman Ndi Okereke-Onyuike is also the head of Africans for Obama, a Nigeria-based support group. She was interviewed by the EFCC after media reports that the Obama campaign had disassociated itself from the group. Mrs Okereke-Onyiuke said in August there had been a misunderstanding in the press regarding the event. The money was going to be spent on adverts encouraging Nigerians in the US to vote for Mr Obama, she said. Tickets to the lavish event in Lagos on 11 August cost more than $21,000 (£11,000) for an eight-person table. "We never said we were going to donate money for the campaign," she said. "We paid for the hall and the entertainers and the surplus, we said would be spent on advertisements aimed at persuading Nigerians to tell their relatives in America to register to vote. "There is not one Nigerian who doesn't have a relative or friend in America. 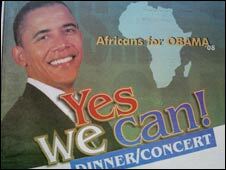 Our aim was to encourage those people to tell their family who have the right to vote in America to vote for Obama." Full-page adverts in major newspapers publicising the event did not mention what the organisers were planning to do with the money. Tickets to the gala dinner at the Muson Centre, usually used for conferences and trade shows, were split into two price ranges: "gold" and "platinum". Individual tickets for the more expensive platinum range cost $2,754 (£1,300) with an option to buy a "corporate" table sitting eight for more than $21,000. She said the press was trying to attack her because they were jealous of her success. "I am a woman of the highest integrity," she told the BBC News website. A statement form the EFCC said they had ordered Mrs Okereke-Onyuike to "steer clear of such activities in future".